The „Stadtautobahn“ (Berlin‘s innercity highway) is, next to the old airfield „Tempelhofer Feld“ and the „Tiergarten“, one of the largest contiguous, innercity spaces. Therefore it offers the potential for a high degree of redensification. 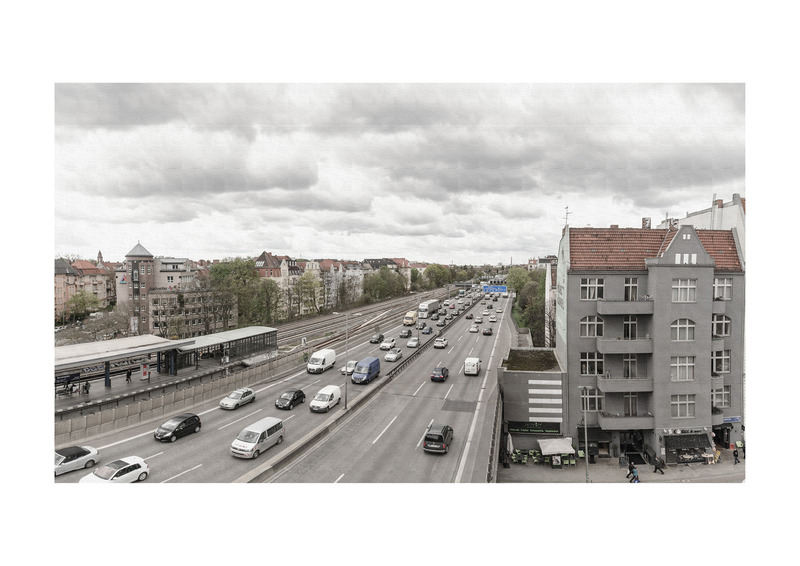 A green belt of apartments and recreational areas runs through Berlin and interweaves adjacent districts, it bridges gaps in the city’s context and activates neglected urban areas. 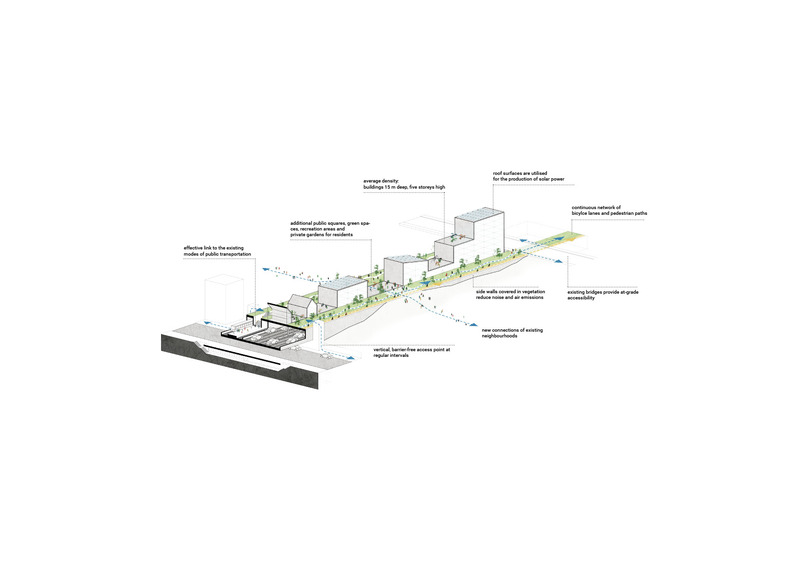 The connector between neighbouring districts, on the one hand, barrier shielding the city from noise, traffic, and air pollution on the other. Instead of transforming valuable green spaces into building land, an additional innercity green belt winds its way through Berlin. In addition to the mixed use of residential buildings and areas for recreation, new routes for pedestrians and cyclists evolve. The stratification and interlacing of different forms of mobility follow the guiding the principle of the compact, land-efficient, urban city of short distances. Creating this superstructre with an average width of 50 m, including a 15 m wide strip of buildings (average of 5 floors) in the middle, results in 1.500 000 sqm of new residential space and 700,000m2 of public space. The currently controversially discussed extension of the Stadtautobahn is already under construction. 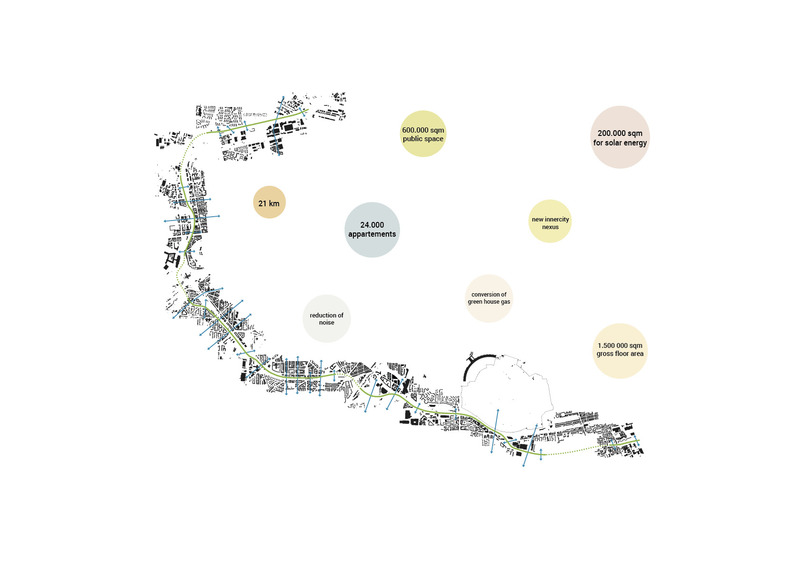 It offers the possibility to test the housing construction in some areas in order to reconcile arguments for and against the infrastructure project. A compact and dense city, offering affordable living space, requires all the more the quality of public green spaces and urban spaces. Existing public spaces will be preserved against today‘s developmental pressures for the future. 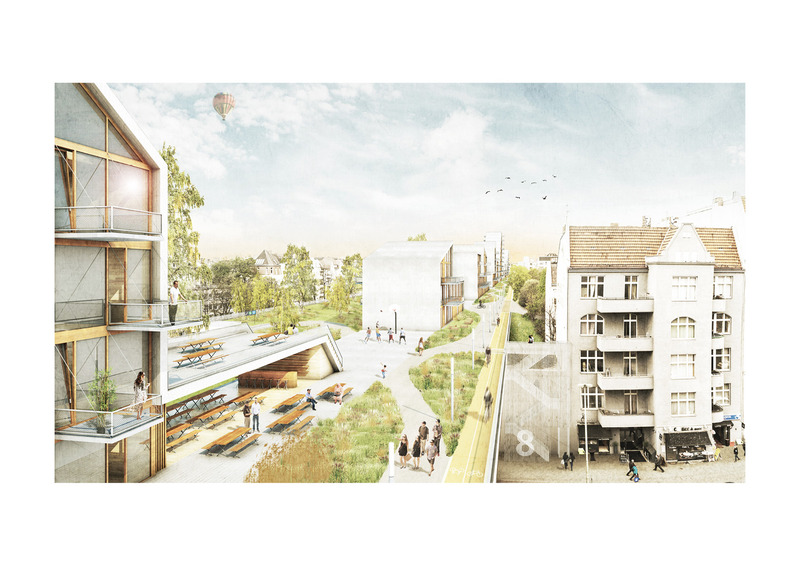 For this, a structural barrier previously interjecting the urban continuum is reconverted into a residential landscape for all, and adjacent parts of Berlin are reunited.